“Play to your strengths”, they say. “Maximise your game”. Sporting analogies don’t often translate into hotel design but these idioms are what immediately came to mind the first time we walked into the Royal Lancaster London’s existing guestrooms back in 2013. 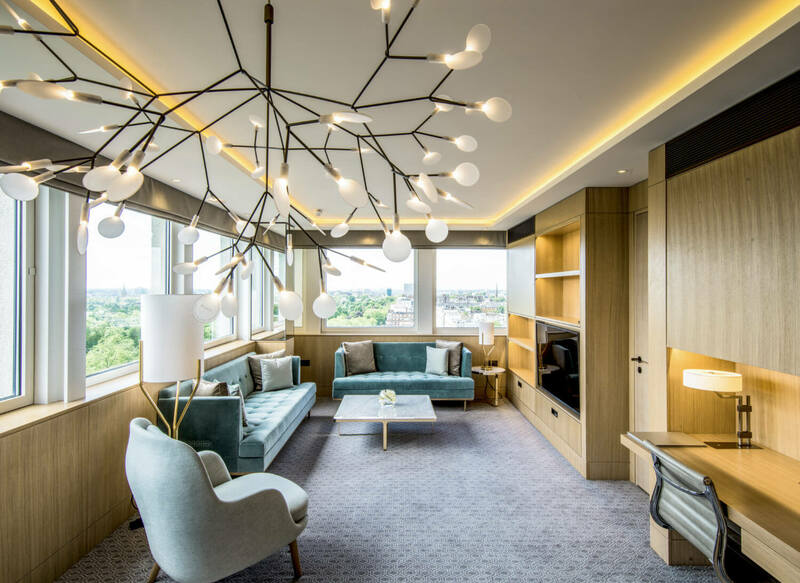 We had been tasked with the renovation of the entire mid-century hotel, updating it to meet the needs of the modern, luxury traveller, whilst drawing on its exciting history and location on the edge of Hyde Park. Many of the guestrooms were modest in size – some less than 20m2 – with windows shrouded in heavy, traditional curtains, making the rooms appear even smaller and quite dark. How were we to transform these rooms into luxurious and memorable places to stay? The answer came when we pulled back the curtains to reveal a wall of windows running the full width of the rooms, through which there were spectacular views. 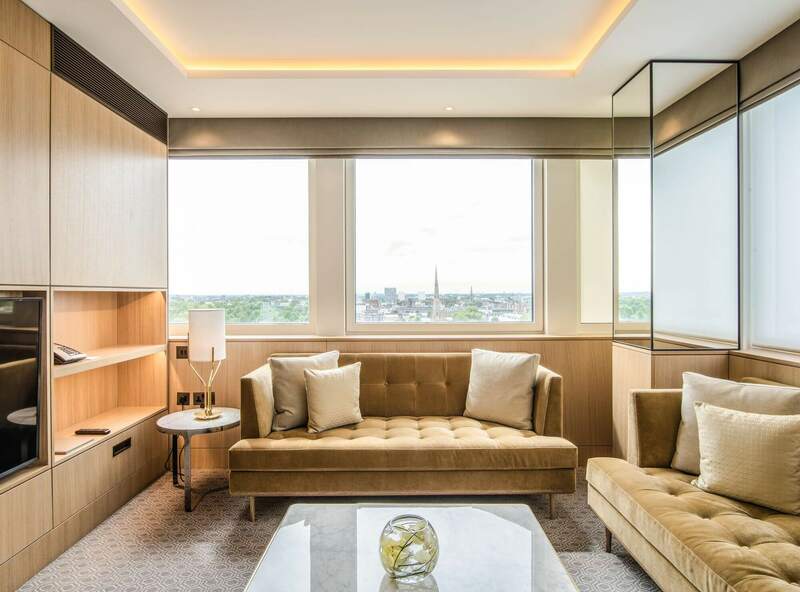 All the guestroom floors are housed in the 18-storey tower, which has no rival buildings blocking its sightlines, meaning that they benefited from 360° panoramas over Notting Hill, the West End, Paddington basin and Hyde Park. We therefore decided to make the view the centerpiece of each room, tailoring the design to protect and enhance them. Our first decision was to remove all curtains and replace them with two sets of electric blinds – one privacy and one blackout– operated via bedside switches. These meant that the windows could be completely unobstructed, opening the room up to the views; this sleek feature also perfectly blends with the mid-century-inspired décor that pervades the entire refurbishment. It also gave us more room to work with, enabling us to introduce a desk that extends across half the width of the wall before its frame drops down to form a daybed. 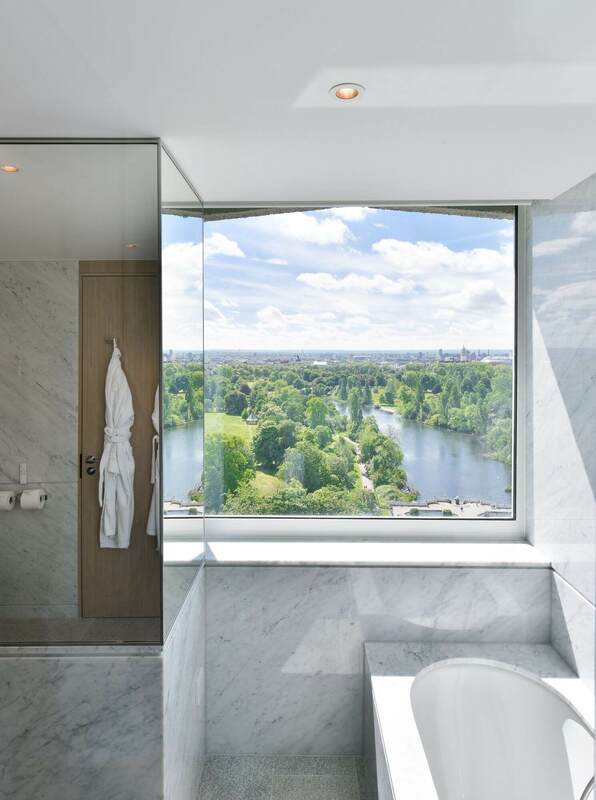 Not only does this bespoke joinery make the most of otherwise dead space, it gives guests two seating options from which to enjoy the scenery – one, a tranquil spot to work from, the other a place to lie back on plush mohair velvet and pick out iconic buildings within London’s skyline. Our intention was not only to make the view a defining feature whilst inside the room, but to create a magic moment for each guest when they opened the door to their room and to be greeted by the unbroken panorama. Therefore, we made the decision to widen the doors to give this instant “Wow” factor. We worked closely with the door manufacturer to minimise the frame depth whilst maintaining security and improving soundproofing. The height of the door was also extended to the corridor ceiling so that the views out the windows were framed from the moment the guest opened the door. Further to this, we designed the internal guestroom entrance in a way that ensured the sightline through to the windows remained clear. We were also keen to bring the view into the room décor itself without detracting from the main spectacle. The North facing “City Rooms” are punctuated with deep yellows and mustard tones, whilst the “Park Rooms” overlooking the Italian Gardens are infused with muted sages and pastel greens. The palette on the 18th floor is richer, with deep teals, petrol blues and suave cognac tans, and the views are alluded to in tree-like modern chandeliers, floor lamps and other design touches. The cumulative result is 15 floors of guestrooms where an unmistakable and inimitable sense of place has been created by allowing the view to be the star and the inspiration for the interior design. What Makes a Great Family Hotel?